Detective Orr died from injuries received in the crash of a helicopter during a search and rescue operation. On Nov. 21, the 35-year-old victim was a passenger in a privately owned and piloted helicopter volunteered to search for a missing woman. 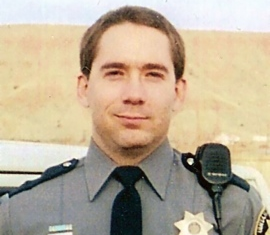 As Detective Orr was coordinating the search from the air, the helicopter struck a power cable near the town of Jensen and plunged into the Green River. Detective Orr died of his injuries after being airlifted to LDS Hospital in Salt Lake City. The civilian pilot was critically injured but recovered. Married and the father of four children, Detective Orr is buried in Lapoint City Cemetery. His bronze name plaque is sponsored by his wife and children, Holley, Jessica, Tyler, Kaylee and Ashlee Orr. Kevin, you were one of the most honest LEO’s that I have ever met and that is rare in that world. Take care my friend and may God Bless you! Kevin your missed dearly. I love you with all my heart and wish that this was not real. I wish you were still here. Your children miss you so much. We love you!!! To the family of Officer Orr. May God always shine on you through your grief and loss. if love could have save you, You would have Lived forever. I heard one of your daughter’s speak at a gathering for fallen officers. You would be so proud! She was amazing!